The objective of the analysis was to determine stresses induced by the wheel as it traversed the wheel chock. 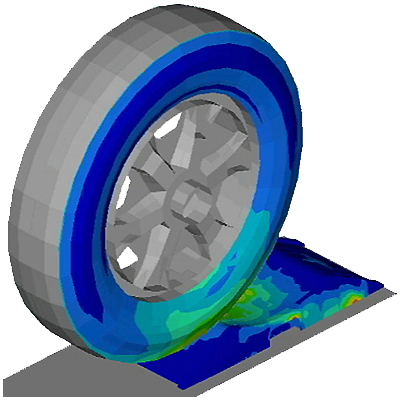 In order to predict an accurate pressure distribution, the tire was modeled using an elastomeric (rubber) material. Modeling the event as a single, dynamic simulation simplified the exercise by eliminating the need for multiple static analyses. 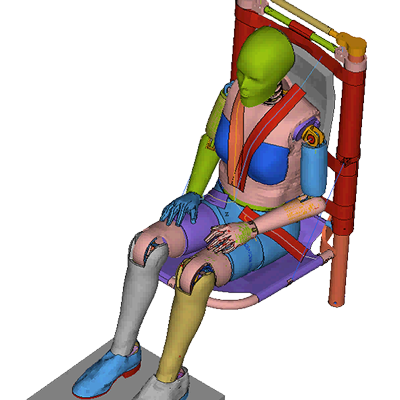 Simulation of a seat absorbing mechanism during crash landing was performed to predict spine and neck injury experienced by the occupant. Various sized virtual human manikins were employed in the study. The approach allowed elimination of a number of costly, physical tests. A fuel flow metering device was analyzed to assess durability in flight environments. Stress ranges during flight loads were determined and used to predict fatigue life and reliability of the device. 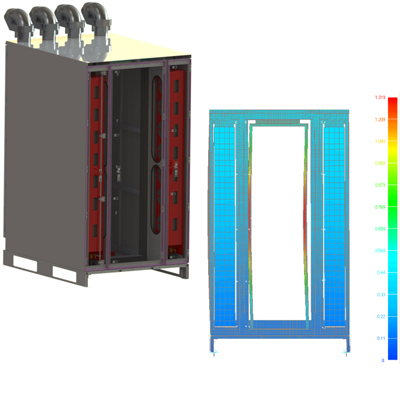 Additionally, a CFD study was performed to predict cooling performance of the electronics' heat sink. 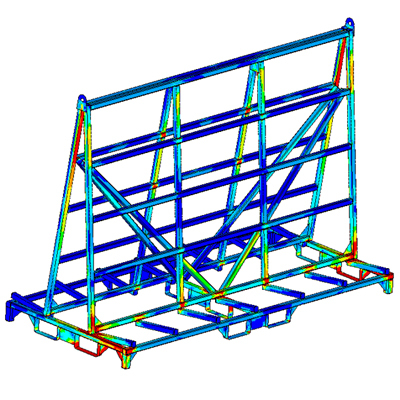 A class-A truck seat suspension was analyzed for FMVSS 207/210 pull test load requirements. Design changes were introduced and compliance was verified by analysis and physical test. A study of post-yield stress relaxation in Ti-6AL-4V due to vibration load was carried out by a combination of photo stress test methods and FEA. 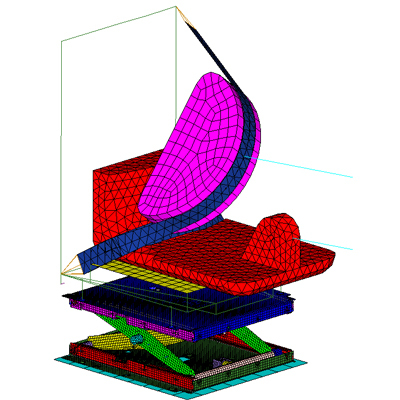 The numerical material model was improved to reflect behavior from the test. 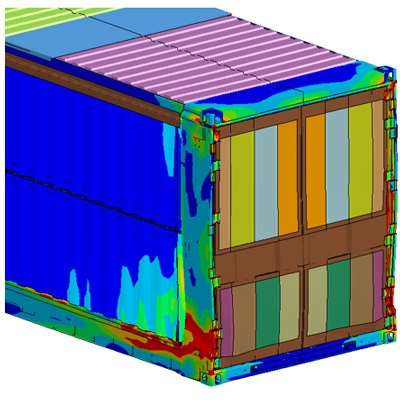 An innovative collapsible shipping container was subjected to standard stacking and lifting cases per ISO standard. 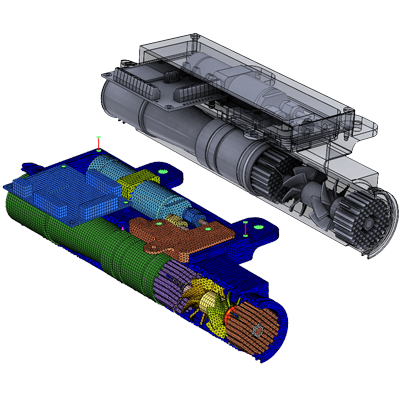 Detailed modeling of locks and hinges with rolling contacts allowed identification and elimination of failure modes. Simulation of a medical device part transfer between bowl feeder and serializing laser to optimize actuator travel. Seismic analysis of a data center server rack to assess compliance with GR-63 Network Equipment Building Systems (NEBS) requirements was performed. After initial analysis, floor rails were redesigned to achieve Zone 4 performance. 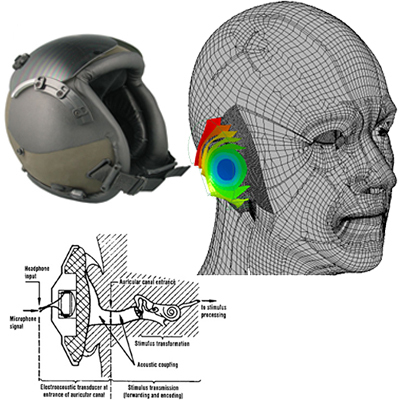 An FEA acoustic model was created of both pilot helmet and a human ear canal for predicting noise and communication intelligibility. The LS-DYNA model consisted of a sequence of structural modal, steady state dynamics (harmonic) and FEM acoustic analyses. Once modeled, iteration could be performed to improve helmet noise mitigation. 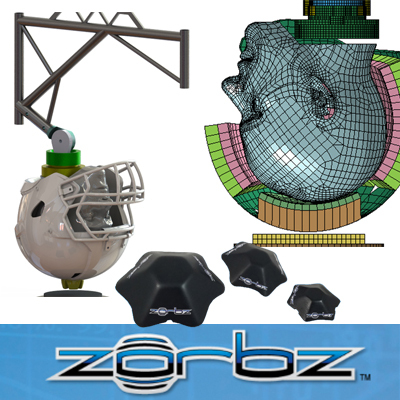 Simulations of NOCSAE football helmet tests have lead to a better understanding of impact protection limitations existing in current products and helped in development of injury reducing technology such as the Zorbz device shown above. The exercise was a result of the NFL's Play Smart Play Safe initiative that challenged innovators to propose new devices for improving the safety of the athletes. Structural analyses were performed on a large, elevated bin used in aggregate processing. 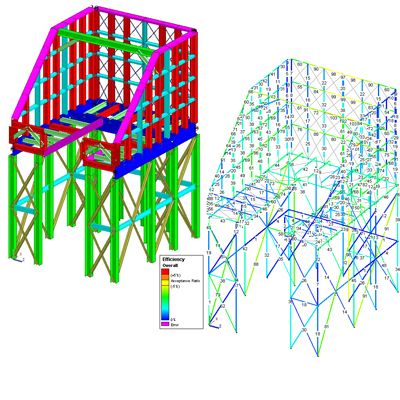 Specialized software was utilized to check each member to steel design code. By quickly iterating, an optimal design was achieved in terms of safety, strength, and weight. 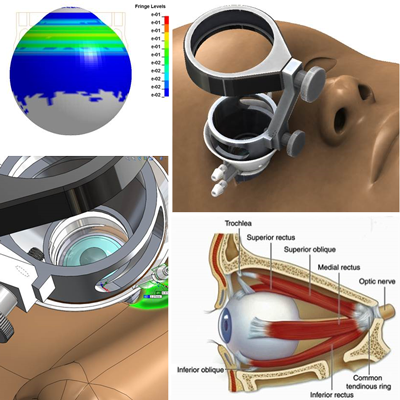 A series of various LS-DYNA studies was used to support development of an innovative ophthalmic device which is used to immobilize the eye during laser cataract surgery. The analysis allowed estimation of intraocular pressure for evaluations of different designs. Additionally, a performance of vacuum seal between the cornea and device was determined. 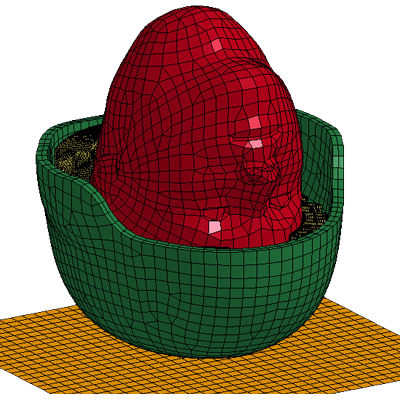 Modeling of mechanical response to impact of existing Army helmets was performed. The model was calibrated using test measurements and then used for development of alternative pad systems. Headform acceleration and HIC was used to assess system performance. 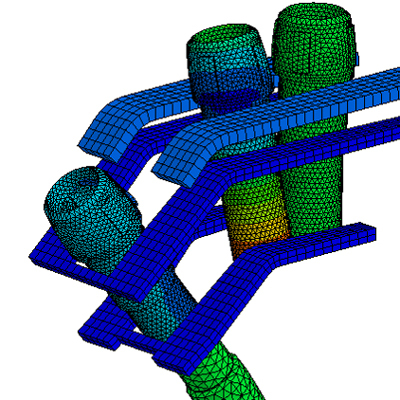 Linear stress analyses for various configurations of a pipe cutting machine were analyzed. Stresses and deflections resulting from gravitational loading were considered and compared to the materials' yield strengths. Lastly, a transient modal load case was performed to estimate deflections due to cutting forces. 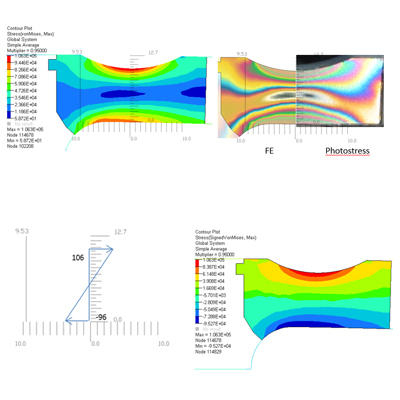 An analysis of an auxiliary innovative fuel tank was performed to simulate forces occurring during hard landing mishap. 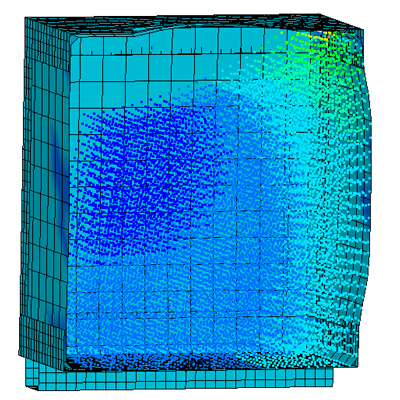 LS-DYNA solver was used to predict sloshing shock wave pressure induced on the tank walls. The fluid was modeled using an efficient meshless approach. 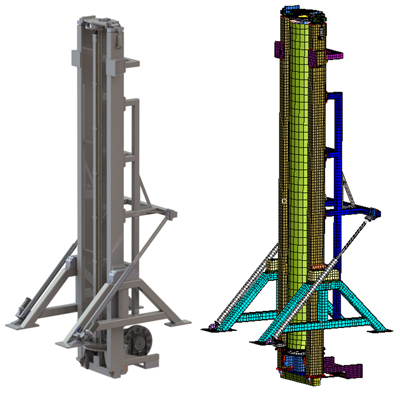 A light-weight transport rack used in the manufacturing of aluminum doors and windows was analyzed under various loading conditions that included fork lift pick up, braking, unloading and sudden stop. The Proof team performs so well that we have incorporated their mechanical engineering expertise into our own value proposition.